Right. This is always going to be a scary prospect, whether you’re a collector or a gamer, painting your army’s Primarch (Konrad Curze for me), is a daunting task if you let it be one. Lets face it. You’re about to paint a single model that cost somewhere in the region of £60……………. I must admit as cool as I’m trying to appear I was a little bit worried the only way I could approach this was to just treat it the same as any other model. First up the bath and scrub for Konrad Curze with the rubbing compound I mentioned in my previous blog, then dry and undercoat. All straight forward so far. The real issues came in getting the colour right. This is one of my biggest issues with Forge World painters, and where the whole paint snobbery starts to kick in. 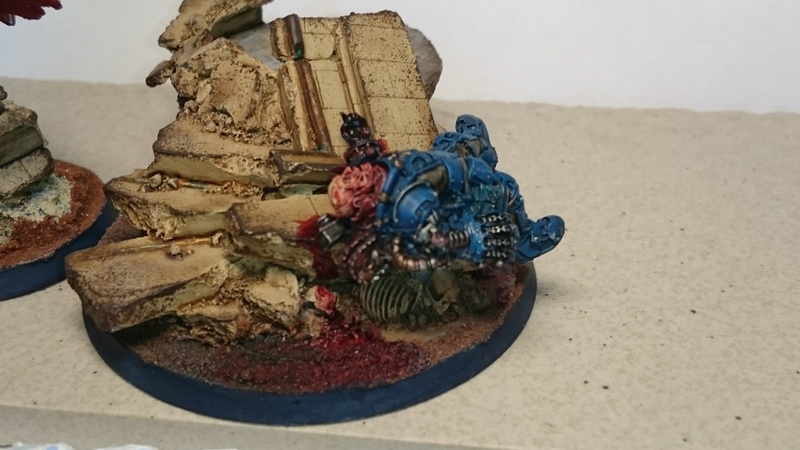 Forge World painters are infuriating as most of the time they don’t use any of the paints they sell on their own website. 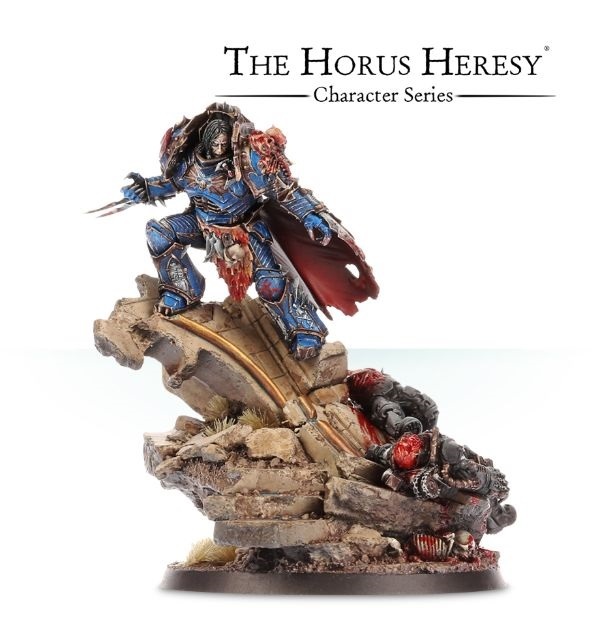 After purchasing the Forge World Night Lords paint I quickly realised it wasn’t the same as the colour they use on the Forge World shop model. The model you’re going to try to paint, but then quickly realise you’re going to have to do more research to find out what paint they actually used, and go out and buy the paints……. Well this is where I draw the line. I’ve already invested a lot of money in various paints (Games Workshop/Forge World) now the snobbish Forge World painters want me to go and buy another company’s products to paint their model…. 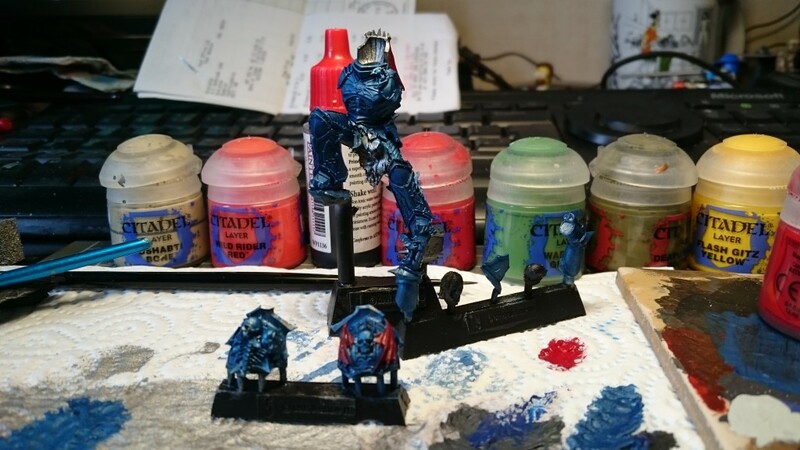 not a chance, so I’m going to show you how I got as close to the website colour scheme without having to buy loads of other paints from different companies. As you can see, it’s an impressive colour but that is not what the Night Lords colour looks like from Forge World. Right onto the painting …..I don’t want to go down the rabbit hole of elitist painters again. We’ll save that gem for another day !!! After the black undercoat, I dry brushed the whole model except the parts shown as gold on the above model. Arms, hands, and bodies on the base with GW Ironbreaker to give me a lighter surface to paint over. Then came a few test mixes of Kantor Blue with Ironbreaker until I was happy it was a close match. Next up, I used some of the Asurmen Blue wash ( this is an old wash they no longer do, but the new Drankenhof Nightshade will give you the same result ) with some of the Lahmian Medium to help control where I wanted the wash to be darker, and not pool over areas I didn’t want it to. This was a tip from a really good friend of mine. Before this I had only used the medium with paints to thin them down, but not dilute the colour. 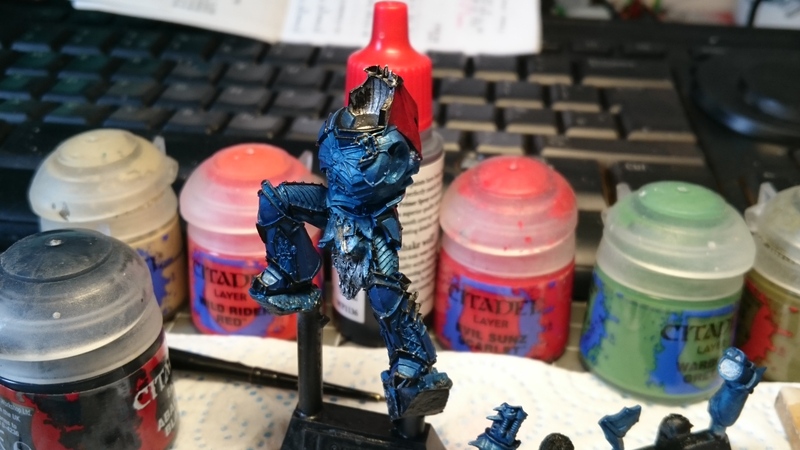 Once it had dried, I mixed the armour colour again with slightly more Ironbreaker to lighten it up a bit then carefully dry brushed it on the main areas leaving the darker blue wash at the edges of the armour. Next step was to go over the black I had done my best not to go over while dry brushing at the start. As you can see I failed miserably with that task. Easily rectified with a touch up of Abaddon Black then painting on some Gehennas Gold, which I then covered with Agrax Earthshade and a bit of Nuln Oil to take the shine off the gold and dirty it up a bit. 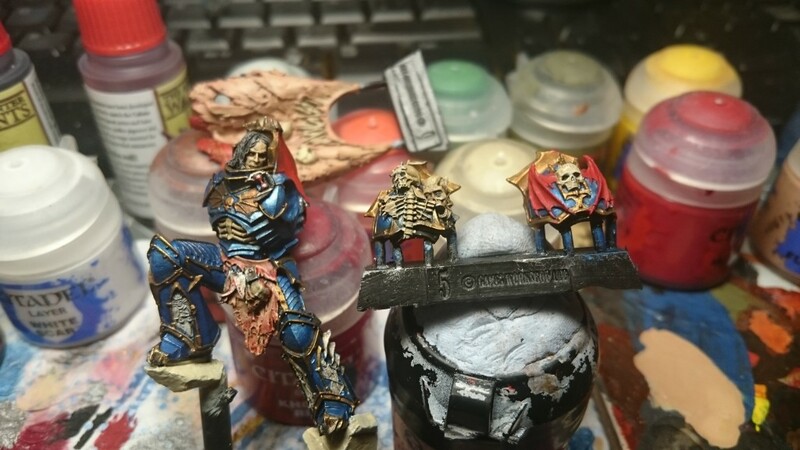 The skulls and portraits are just Ushabti Bone with a wash of Nuln Oil over the top, being careful to not get any on the blue of the armour. The red of the wings on the shoulder pad and his back were Mephiston Red then lightly dry brushed with Evil Sunz Scarlet to do a quick edge highlight to make them stand out a bit. The skin on the cloak, and bit hanging at the front of Konrad Curze was just Cadian Fleshtone washed with Nuln Oil, and dry brushed and stippled with Kislev Flesh to give it the blotchy appearance of skin. For the blood I must admit I struggled because I was going to use the Blood For the Blood God technical paint, which is great, but on its own dries a bit shiny. So, I mixed in some Carroburg Crimson, and a tiny bit of Nuln Oil, to darken it up, and luckily it dried with a matte finish. Anything that looked like bone had the same treatment as the skulls and portraits. The cloth part of the cloak was Khorne Red with Mephiston Red dry brushed over, then the Evil Sunz Scarlet to try to give it a bit of a highlight. I wasn’t concerned about the cloak material being perfect as where it is on the model you get a natural shadow over it anyway. I think for a lot of the painting on this model I just lucked out and things worked out how I wanted. It’s all down to how much time you’re prepared to spend on each part, and what effect you want. Right. The base this was really worrying me because of the nature of the model. You’re painting it in bits anyway, so it would be hard to get a uniformed look to it. 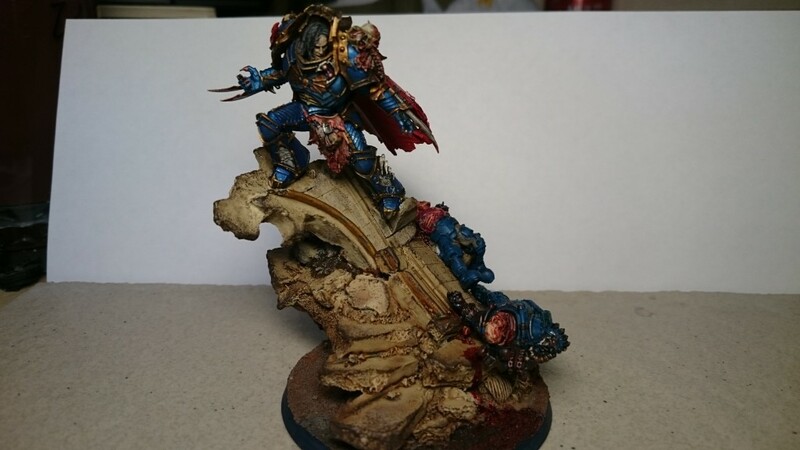 I painted over the black with Ulthuan Grey, the best covering paint GW have ever made. After that had dried, I went over it with Ushabti Bone. The brass parts were done using Gehennas Gold, and a little Ironbreaker added to it to lighten it up, then a couple of small dabs of Sotek Green on the broken edges to represent the tarnish brass gets as it weathers. Then the whole base was washed with Agrax Earthshade and a bit of Nuln oil. The only reason I added the Nuln Oil was because I felt it needed to be a little bit darker. Once the wash had dried, I did a very light dry brush of Ushabti Bone. Now I have already seen a post on here about how to do damage, and I have mentioned my go to damage maker. It’s a bit of sponge, and apply some Dryad Bark. Dab most of it off, and just go for it pressing harder on areas you want more of a damaged/dirty effect. 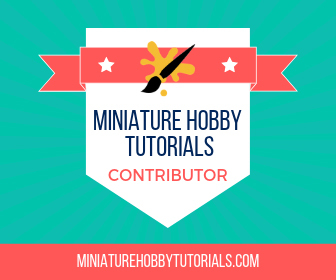 This was a tip from one of the GW paint tutorials for the new Tau range and I have to say it’s simple quick and effective. Konrad Curze’s face was Cadian Fleshtone washed with Nuln Oil, and lightened up with the Kislev Flesh, and I think I may have added a little bit of Ulthuan Grey to the last bit of highlight to try to make his face as pale looking as possible. The eyes all I did was leave a concentration of the Nuln Oil there to give the eyes a dark sunken appearance………..plus the fact I really didn’t want to try painting eyes. That was only going to end badly…..
For the bodies I wanted a similar colour to these by using the Sotek Green, and a wash of Asurmen Blue, then a quick dry brush and highlight with the Sotek Green. The metal work was done with Ironbreaker and Nuln Oil over it, left to dry. The face was similar to the cloak, but without washing it with the Nuln Oil/Kislev Flesh. Then I just plastered it with the same mix of the blood as the cloak. That’s about it I think. I hope that is of some help to you wanting to paint, quite frankly, one of the best models to come out of the Forge World design studio. Everyone tackles things in a different way. Some of my ways might not be the quickest, or they might be, I have no idea. Total time for me on this model was about 4 hours over a couple of days, as life always gets in the way of painting. You’ll have to excuse the poor picture quality. There Konrad Curze is, all ready to go and stomp on some loyalist marines. Thank you for taking the time to read my ramblings. Any questions or any tips you want to throw at me, please feel free to add them at the bottom. Well played, I think you did him a real good service there. Looks very nice. Oddly this didnt show up in my blog feed on my site. Still doesn’t after refreshes. Sometimes there’s a delay. Most likely on my end. Looks great! We have got to get you a photo booth!!!!! I was amazed at how much of a difference it makes, and you can find some basic ones pretty cheaply. Now I just need to get a couple of new backdrops, because the black one mine came with is too shiny, and there’s no mid-tone. Great job on the walk through painting. I think this came out great, and only 4 hours? Damn. I’d have spent that long on a leg or something. 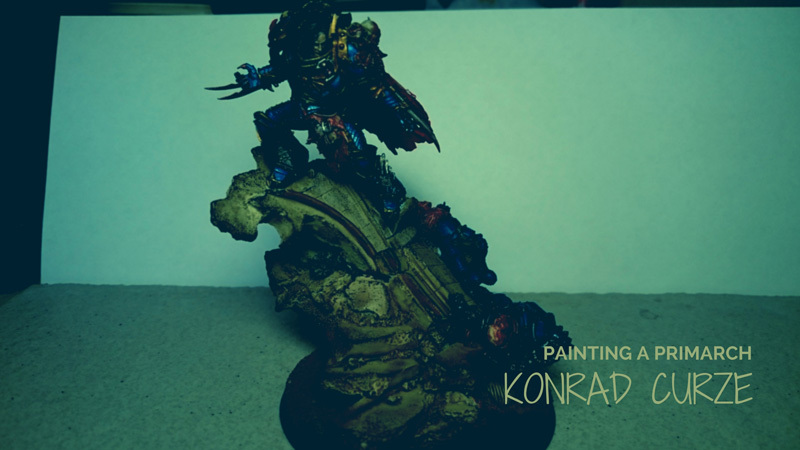 It’s an intimidating model to paint, but you pulled it off. Seems to take me 4 hours just to get motivated enough to sit down and paint lately. I am a very fast painter it seems, I just get on with it I think it’s just my eagerness to get it painted and on the table …. that and the huge back log of minis I have sat waiting to be painted. Excellent walkthrough and paint job. Thanks for taking your time to write it. Not a problem I figured I wouldn’t be the only person annoyed at the fact the Forge World painters use a different paint to the ones Games Workshop sell. Although now I’ve been told by a mate that they only use Games Workshop products now. Thank you and yes i’d agree it’s a worthy model for the price tag. A gamer first and foremost and by my circle of gamer friends the fastest painter around. I'm not a paint snob i don't shoot people down for not doing 55 steps when you only need to do 2 to achieve the same effect. I'd never call myself a pro painter i just paint and if i get lucky and the end result is a decent looking model then it's all good. I'm a petrol head and MTBer at heart and i'll wax lyrical about those subjects as well if i get a chance.